This is gorgeous, Kaye. I love the stamping and the circle. Looks great, the colours are perfect and I love that stamping! Love the zing the flowers give the LO. Thanks Kaye.. you have done a wonderful Job.. I adore that stamping and the flowers really look terrific. 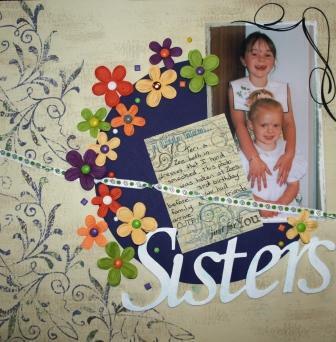 I love the colour combination you've used here Kaye and the stamped corners look great. I must go and look for this sketch, I really like it.